I can just imagine myself in Paris ordering a crepe from a street vendor, paper wrapper crinkling in my hands as I chew into a sweet, deliciously thin crepe. Short of going to France (or maybe the Logan Square Farmer’s market, haven’t tried those crepes yet!) the best I can do is to make some at home. I abide by the”let it rest overnight” rule, and my favorite filling is jam. I love that NYTimes has a recipe search now, I tried this one from 1983. I tried putting them in the broiler for some caramelization, but they looked like they were going to burn. I think they were too close to the heat and I was too impatient. 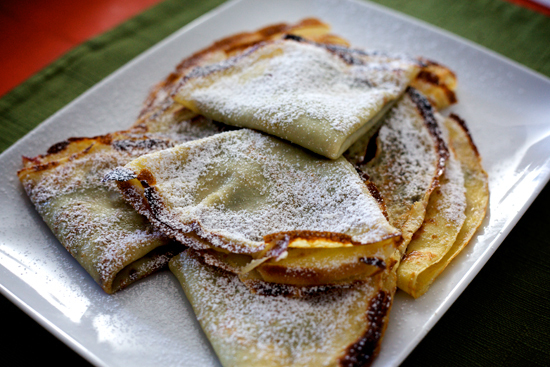 After flipping all those crepes you just want to start eating them. Bon appetit! Hello from Tokyo! You two are not only great chef but also good photographer and food cordinator!! Every dish is so attractive and stimulates my appetite. I ‘ll try to your recipe …! Please keep enjoying your cooking time!